On Monday I challenged you guys to switch up your mindset this upcoming week. I suggested creating a vision board, and I was surprised by how many of you didn’t know exactly what that is! Your vision is essentially the same thing as your goals. It’s where you see yourself in the future, whether that’s a week from now, or 5 years from now. A few years ago I made my very first over the top vision board, and I’ve been hooked on them ever since. I grabbed my collection of magazines and started cutting out images that inspired me and stuck them on a giant poster board. I kept it right next to my bed so that every morning I was instantly reminded me of what I was working towards. I knew what I wanted to accomplish, and it was up to me to take the steps necessary to accomplish those goals. I’m a strong believer that there’s a mental shift that occurs when you can physically see your goals laid out right in front of you. I strongly encourage you guys to try this. If you’re not feelin like gettin all crafty, they are SO easy to create on your phone. Find pictures that represent your multiple goals, put them in a collage, and BAM you’ve made a vision board. Better yet, dedicate an album in your phone to pictures that have significance to you. Whenever you need an extra boost of motivation you can easily swipe through that album, take a deep breath, refocus, then start hustling again. 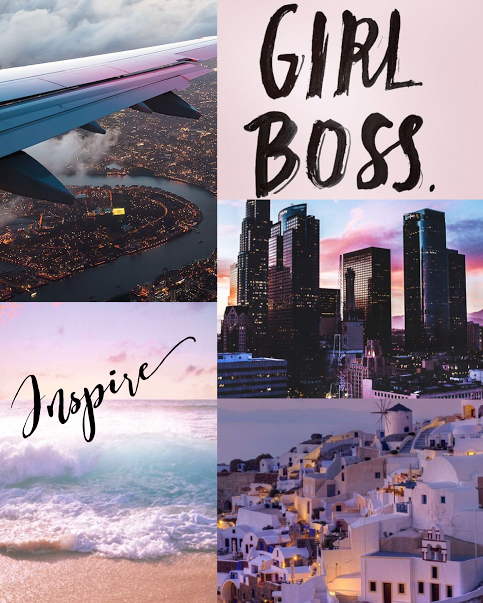 I’m not going to show you guys all of my boards…you can’t know everything I’m workin towards 😉 but for this one I chose pictures that represent things that I want to do in the next 10 years: travel the world, become my own version of a “girl boss”, inspire others, move to a big city in my 20’s, eventually settle down by a beach, and watch the sunset in Mykonos, Greece. Of course the more specific you are the easier it is to accomplish, BUT what can I say…I like to dream big. What do you guys think of the whole vision board idea? Those of you who have tried it, do you think it’s helpful?